When you leave a comment on THIS post by 6 p.m. CT Sunday, July 21, 2013 you'll be entered in the DRAWING for a copy of the book mentioned below. If you mention in your comment that you’re a follower (see in the left column “Join This Site” and “Follow by Email”), I’ll add your name a second time in the drawing. You must be eighteen, have a U.S. mailing address, void where prohibited. You can read details about my book giveaways at Disclaimers. JO: Please tell us a little about yourself. BECKY: My hubby, Steve, and I celebrated 39 years of marriage on July 13. We are blessed with three great kids, a beautiful daughter-in-law, an almost son-in-law, and three gorgeous grandchildren. I’ve been writing for more than 30 years. Until my first novel was released last year, I wrote mostly nonfiction but was foolish enough to think the transition to fiction writing would be easy. Other authors may find fiction easy, but the learning curve for me was steep, and I continue to read how-to books, blogs and newsletters and attend workshops and conferences to help me grow as a fiction writer. JO: What fun or unique things can you tell us about yourself that we don’t know? BECKY: I’ve lived in the West all my life, so am fond of tall mountains, far vistas and outdoor activities. Thanks to two sets of homesteading grandparents and DIY parents, I also tend to be a DIYer. I’ve hung wallpaper, covered furniture, roofed houses, and made everything from stained glass art and needlework wall hangings, clothing, cushions and curtains, to calendars, designer t-shirts, soap, lotion and notecards, to yogurt, noodles, bagels, crackers, sauerkraut and kombucha tea. 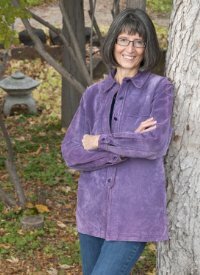 I don’t know if you’d call this aspect of my personhood fun or unique, but it might interest readers to know that after experiencing toxemic pregnancies many years ago, I began studying nutrition and healthy living. You can read more at grandmagonegranola.wordpress.com. JO: Please describe yourself with three words. BECKY: In addition to walking, hiking and camping, I like to snowshoe and cross-country ski and I love to read (all kinds of stuff), study the Bible with my women’s Bible study group and hang out with my family and my writing friends. JO: How did you become involved in writing? BECKY: Although my high school English teacher encouraged me to go into journalism, I earned a Church Education degree from a Bible college. Before I had a chance to use the degree, Steve and I married and started having babies. When our first child was just beginning to walk around furniture, I saw a notice in the local paper for a community service writing class. Intrigued, I signed up for the class, found a babysitter and ended up writing a couple feature articles for the newspaper, thanks to the reporter who taught the class. I’ve written articles and stories for a variety of publications over the years and published two nonfiction books and two fiction books. I also edit fiction and nonfiction for a variety of authors and publishers. BECKY: I am blessed with a great office that has big windows and a wonderful view of nearby mountains. In a couple of our former homes, my writing area was a dark corner in a windowless basement. Although not the most pleasant places to work, I probably had fewer distractions without windows. Even so, I love my sunny workspace. JO: Do you always know the title of your books before you write them? 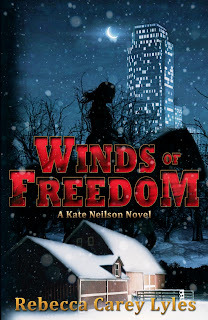 BECKY: The titles for the Kate Neilson series came together over time, but for quite a while I planned to follow Winds of Wyoming with Winds of Change and then end with Winds of Freedom. However, as I wrote the second book, I realized Winds of Freedom was a more appropriate title than Winds of Change, which should be perfect for the third and final book in the series. JO: Please tell us about Winds of Freedom. Winter storms blast across the West and fuel the bitter wind that ravages ranch-owner Kate Neilson Duncan’s soul. In the midst of shattered dreams, she learns her best friend has not only disappeared, she’s been accused of murder. Kate vows to find her and prove her innocence. When the Duncans’ Wyoming ranch is threatened and Kate's mother-in-law becomes ensnared by evil, Kate and her husband, Mike, join forces with their foreman to fight for all that is dear to them. Can the three ranchers defeat the lethal powers determined to destroy Kate, their loved ones and their ranch? JO: What takeaway value do you hope your readers receive after reading this book? BECKY: I hope readers are reminded of the power of prayer and the value of hope (Romans 15:13) as well as the need to obey God’s Word and listen to his Spirit. I also trust they gain new compassion for those caught in circumstances beyond their control—or beyond their understanding. JO: Where did you get the idea for your book? BECKY: The idea for Winds of Freedom came years ago when the relative of a neighbor walked into an airport restroom and never came out—as far as her husband and children knew. Although they didn’t see her exit the restroom, she must have snuck past them wearing a disguise, because they later learned she’d snuck away to start a new life. Several weeks after her disappearance, she returned to pick up her clothing and other personal items. She didn’t tell her husband where she was living or what she was doing, only that she no longer had to clean house or take care of children. To add to the mystery, she was wearing a collar around her neck. JO: Did you have to do any research for this book? BECKY: For both Winds of Wyoming and Winds of Freedom, I had to research bison. They’re fascinating animals. I also spent time online and at the library looking up facts about Wyoming and other regions mentioned in the books. Quite a bit of the action in the second book takes place in another state. BECKY: My first book, which was co-written with Larry Baker and titled “It’s a God Thing! Inspiring Stories of Life-Changing Friendships,” debuted in 2000. A couple years ago, I reprinted the book and made it available in paper and ebook formats online. People are still enjoying Larry’s stories! JO: What advice would you give to writers who have been writing a few years but still haven’t interested an agent or publisher in their novel? BECKY: Be teachable and tenacious, develop a tough skin and self-edit like crazy before you send your manuscript to anyone. Better yet, self-edit plus join a critique group. One book I recommend is “Self-Editing for Fiction Writers: How to Edit Yourself into Print” by Renni Browne and Dave King. BECKY: I wish I could say I’d started the third book in the Kate Neilson trilogy; however, I probably won’t get to that until next fall (after our daughter’s wedding!). In the meantime, I’m gathering ideas for Winds of Change and editing my short stories to compile and sell online. I’m also editing a former classmate’s memoir and a World War II novel by a new author. BECKY: Read, read, read, including how-to-write books, and write, write, write. Whether it’s a journal entry or an email to your mom or a chapter in your book, write something every day…well, almost every day. Vacations and breaks are good for the soul! BECKY: My nonfiction books, It's a God Thing: Inspiring Stories of Life-Changing Friendships and On a Wing and a Prayer--Stories from Freedom Fellowship, a Prison Ministry, are available online (print and ebook formats) and can be ordered through bookstores. Currently my indie publisher is offering Winds of Wyoming on Amazon (ebook and print formats) to take advantage of the KDP Select program. For the first three months following release, Winds of Freedom will be in the same program (and same formats) and then will become more readily available. JO: Please tell our readers where they can find you online. BECKY: Thanks so much for letting me visit your blog, Jo. Bless you! JO: Thanks for the interesting interview and for offering a copy of Winds of Freedom, which one of our commenters will win in a random drawing. Remember: leave a comment on THIS post by 6 p.m. CT Sunday, July 21, 2013 and you'll be entered in the drawing for a copy of Winds of Freedom by Rebecca Lyles. You must be eighteen, have a U.S. mailing address, void where prohibited. Please, please remember to leave your email address or I cannot enter you in the drawing. I’ll need you email address so that should you be the winner I can get in touch with you for your mailing address. I’ll announce the winner in Monday’s blog. Oh, my word, I want to read this one. I read Winds of Wyoming and loved it! Pat, thanks for coming by and leaving your comment. Good luck in the book drawing. The book sounds awesome! Thank you for the giveaway! Wanda, you're welcome. Glad you stopped by and left a comment. Good luck in the book drawing. Sounds awesome - enter me please. Jane, you're entered. Thanks for coming by to read and leave your comment. Good luck in the book drawing. Winds of Freedom looks excellent and I love the cover. Katie, Glad you stopped by and left your comment. Good luck in the book drawing. I enjoyed your interview with Rebecca Carey Lyles. She's a new author for me. Looking forward to reading her books. Sounds wonderful! Thank you for sharing and please enter me in your giveaway. Barbara, you're welcome. Glad you enjoyed the interview. Also glad you've found a new author. You're entered. Good luck in the book drawing. Barbara, thanks for following my blog! Oh my goodness...WINDS OF FREEDOM sounds very intriguing! The inspiration behind it sounds like a work of fiction itself! The saddest part about that is it'll never be all worked out like in a novel. Yikes! Thanks for sharing with us Jo & Becky!! Jo, I'm a FB follower & a newsletter follower. Robin, you're welcome. Thanks so much for following my blog and newsletter. Glad you came by and left your comment. Good luck in the book drawing. hi Becky & Jo. Becky, so excited to see the second novel in your series is out! I'd love to win a copy. Will always remember those wonderful few days I spent with you and Steve at your lovely home in Idaho. Jo, I am subscribed to your blog. Patti, I appreciate you subscribing to my blog. Thanks for reading and leaving your comment. Good luck in the book drawing. Hi Jo and welcome to Becky. Becky it seems you've accomplished so many things in your life. Too many to count. Busy lady. I have Winds of Wyoming and would love to win this following book. I lived in Wy. for 6 years and loved it. Jo Thanks for the give-away and I am a follower of yours. I commented on your Monday post. Maxie, you're welcome. Thanks for following my blog. Glad you came by and left your comment. I saw your comment on my Monday blog, which gives you an extra entry in this one. Good luck in the book drawing. The book sounds very interesting. I would like to read it. I read that you had researched bison. One time Linda and I were camping at Medora National Park, in our tent. I woke up the next morning to a snorting sound. I looked out of my tent and some bison were less than thirty feet from us. Bison are big animals. I NEED YOUR EMAIL ADDRESS TO ENTER YOU IN THE DRAWING. If you should be the winner I'd need it to contact you. Love that cozy cover. I know Rebecca's book will be an excellent read. I grew up in a winter-wonderland state, and there's nothing like a snow fall so deep it allows you a glimpse from the warm inside. Thanks for sharing, Jo. Diane, you're welcome. I'm glad you came by and left your comment. I grew up where we had snow--lots of it--but now I'm farther south and might not survive the colder weather again. Good luck in the book drawing. Diane, I NEED YOUR EMAIL ADDRESS TO ENTER YOU IN THE BOOK DRAWING. If you should win I would need your email address to contact you. Veronica, thanks for coming by and leaving your comment. Good luck in the book drawing.